What Day Of The Week Is August 12? 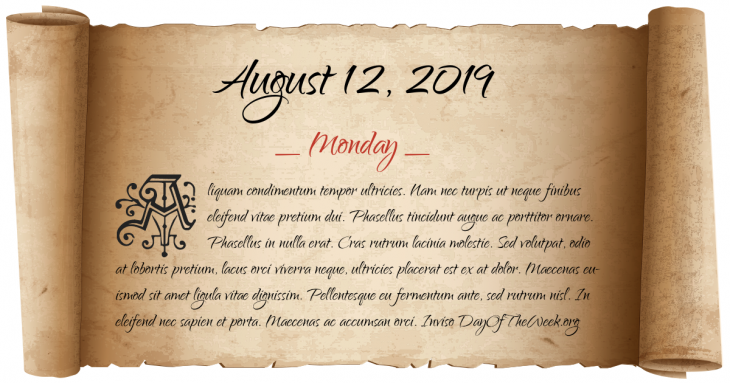 August 12, 2019 is the 224th day of the year 2019 in the Gregorian calendar. There are 141 days remaining until the end of the year. The day of the week is Monday. It is the peak of the Perseid meteor shower. It is also known as the “Glorious Twelfth” in the UK, as it marks the traditional start of the grouse shooting season. Cleopatra VII Philopator, the last ruler of the Egyptian Ptolemaic dynasty, commits suicide, allegedly by means of an asp bite. Signature of the Treaty of Nöteborg between Sweden and Novgorod (Russia), that regulates the border between the two countries for the first time. The president of Louis XIII of France’s royal council is arrested, leaving Cardinal Richelieu in the role of the King’s principal minister. An Armistice ends the Spanish-American War. The Night of the Murdered Poets: 13 prominent Jewish intellectuals are murdered in Moscow. South Africa is banned from the Olympic Games due to the country’s racist policies. Who were born on August 12?